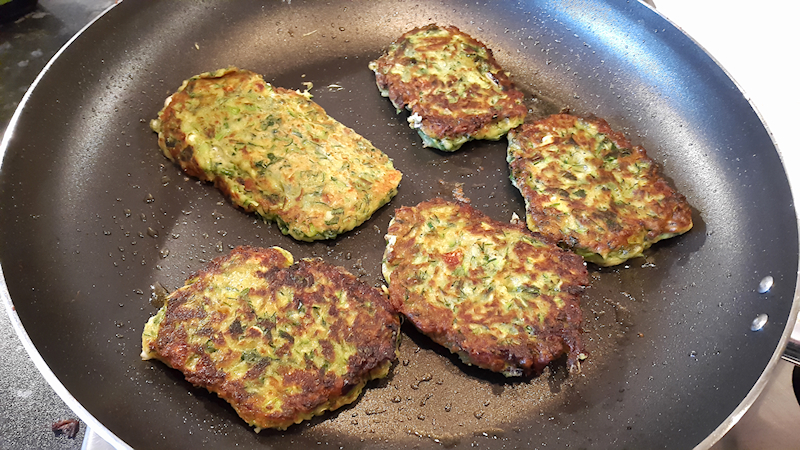 Very easy and delicious zucchini fritters with Feta. 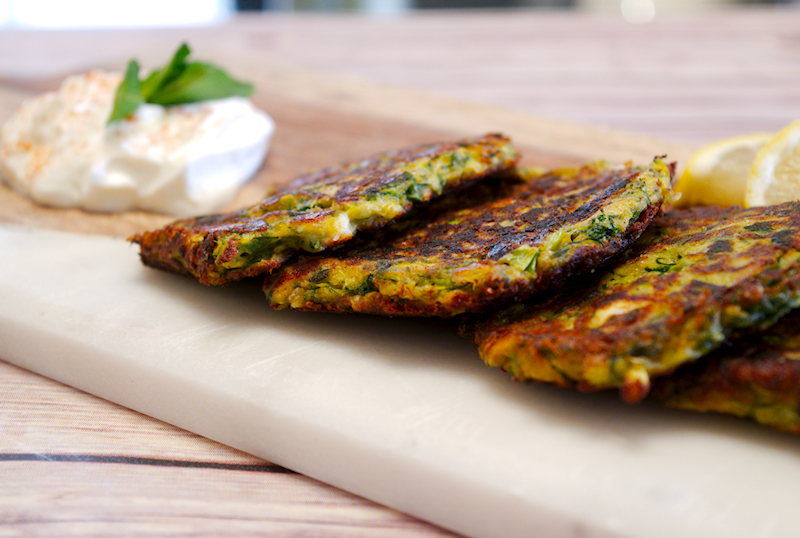 The famous Greek Kolokithokeftedes! 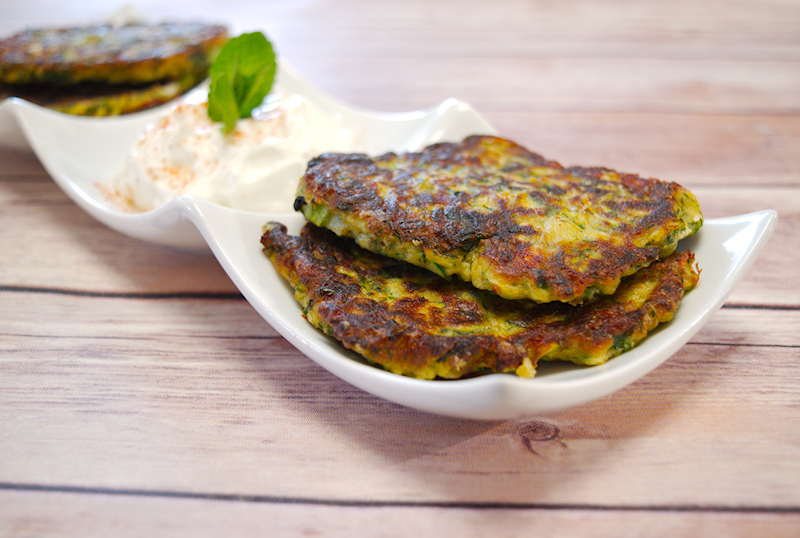 Zucchini fritters have become very popular in the modern western cuisine. It’s probably because of their nutritional value, being suitable for vegetarians and vegans or simply…because they are awesome! The same thing happened in Greece too I guess. 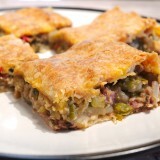 From being a very simple appetizer found in some islands it became one of the most demanded delicacy. Every tavern offers it now. Being very critical about their food, the Greeks often rate a tavern depending on the quality of its Kolokithokeftedes. They have to be soft, aromatic, not too salty and not oily. 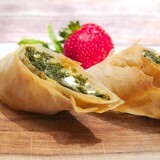 Of course, they have to be handmade and served with some kind of yoghurt sauce, like tzatziki. 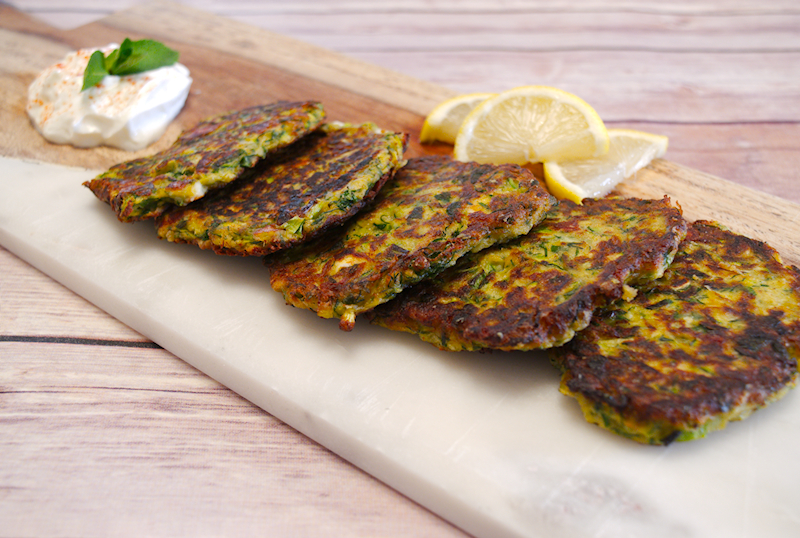 What makes Kolokithokeftedes different from other versions of zucchini fritters is the addition of Feta cheese and the use of high quality seasonal vegetables. It’s true that they taste much better during the summer months when the zucchini have just been collected from the local fields. Kolokithokeftedes are a great appetizer to help you drink your bear or wine but they are also suitable for a light and healthy lunch. Easy to make, I don’t think you need more convincing! 4-5 spring onions finely chopped. 1 bunch of flat-leaf parsley finely chopped. 1 small bunch of fresh mint (the leaves) finely chopped. 1 bunch of dill finely chopped. 100 gr (3.5 oz) flour. Use the coarse side of a grater and grate the zucchini. 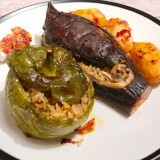 Use a cotton kitchen towel and place some of the grated zucchini in the middle. Close the towel and squeeze as hard as you can to get the juices out of the zucchini. It's very important that the zucchini are completely dry. Place the drained zucchini in a large bowl. 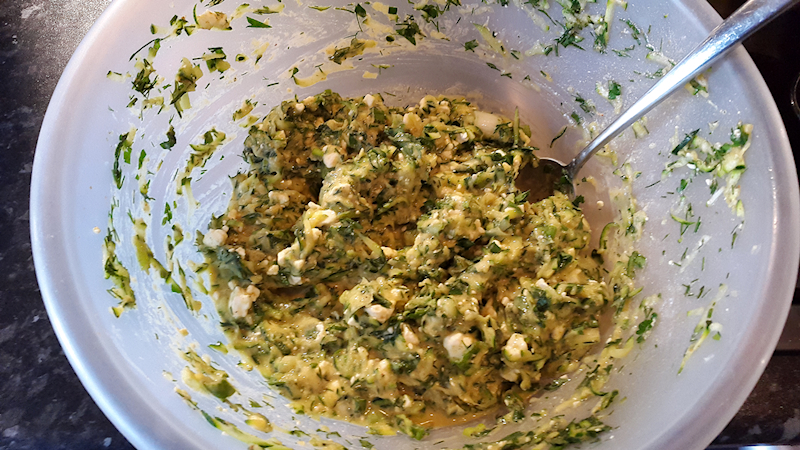 Add the spring onions, parsley, dill, mint, paprika, chili, eggs and Feta to the bowl. Season with salt and pepper (~ ½ tablespoon each) and give it a good stir. Add the flour and stir well. Add 3-4 tablespoons of olive oil to a frying pan on medium heat. When the oil is hot, use a tablespoon and add some of the mixture in the pan. Press it lightly so your fritters become kind of flat. Cook for ~ 2 minutes on each side until golden brown. Place the fritters on a tray covered with paper towel to absorb the excess oil. 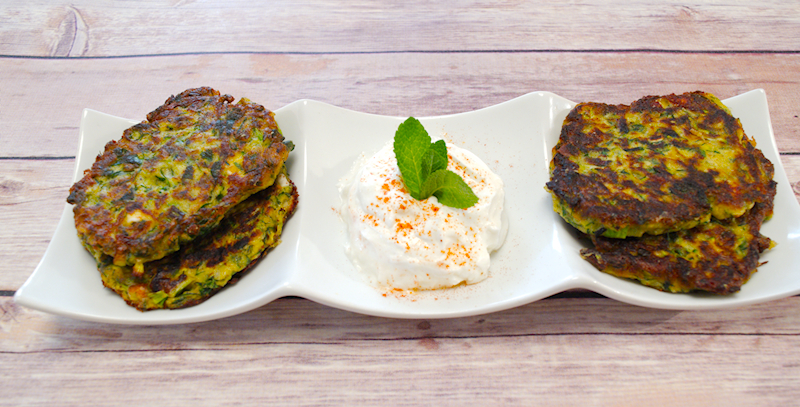 Enjoy your zucchini fritters with some Greek yoghurt.